March 14 (3-14) is officially “Pi Day” and it would not be complete without the “pi”. 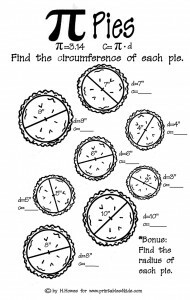 Make math and learning about circles with our tasty “pi pies”. As an activity for the classroom, once kids have printed out and completed the pi worksheet, have them create circles with the same diameters. The students could then work in groups with yarn to measure the circumference of each circle. Their findings should match the answers on this worksheet. Click on image to view and print activity full size.